There are a number of healthy snacks that I recommend – some more conducive for traveling by plane, others better for car rides (since they require a cooler). Raw, unsalted nuts; fruit; baby carrots; nonfat or low-fat yogurt; peanut butter to-go packs; air-popped popcorn; part-skim string cheese; and single-serve packs of hummus are some of my go-to healthy snack suggestions. But when it comes to homemade snacks I can’t say I’ve really made any specific recipes. For me, snacks need to be easy and quick to put together. So when we received this month’s Recipe ReDux challenge, I was a little perplexed about what to make. A few months back I saw a recipe for these delicious looking Chocolate-Peanut Butter Cereal Bars in Martha Stewart’s Everyday Food Magazine. At the time, I thought these looked amazing, but I was not about to make cereal bars that are 436 calories a pop! So I thought this would be a perfect time to make a ReDux of this recipe. 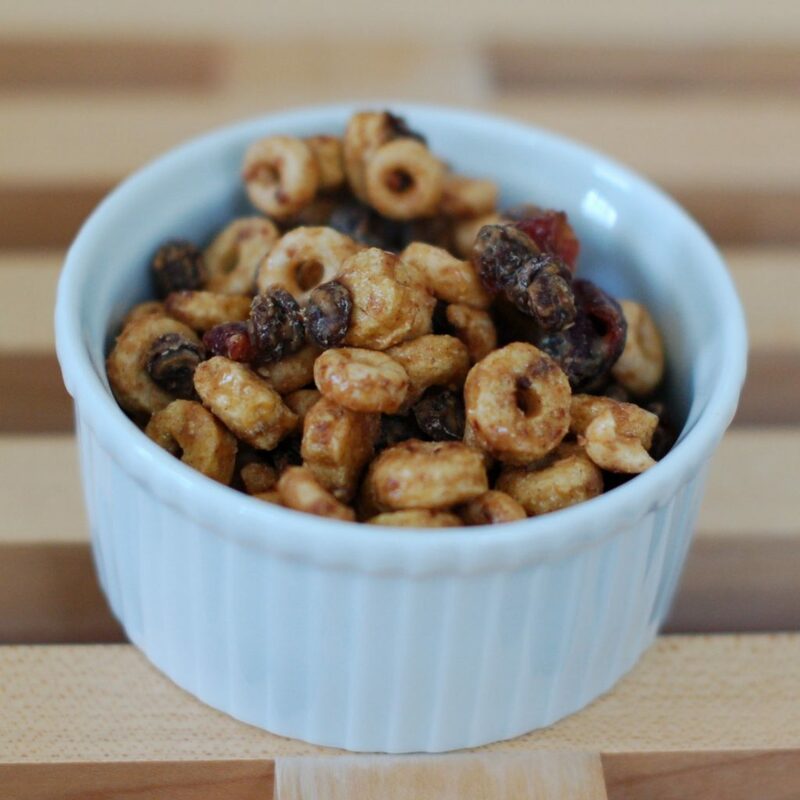 I set about making my own cereal bars, using a mix of toasted whole grain oat cereal and Kashi Heart to Heart Honey Toasted Oat cereal, ground flaxseed, dried cranberries, natural peanut butter, olive oil, and semi-sweet chocolate chips. It all seemed great, especially the nutrition analysis, which came to 232 calories per bar – more than 200 calories less than the Everyday Food recipe. But that’s where the good news ends. Unfortunately, the bars didn’t turn out quite as planned, nor were they as low cal as I believed. It seems I either needed the stickiness of the marshmallows used in the original recipe or some other ingredient to get the bars to actually be bars. Because mine did not turn out that way. As soon as I cut the bars, they fell apart. So in the end, I got a bunch of gooey, delicious cereal mix. It tasted great, but certainly was not the snack I had in mind; rather, I had a new version of trail mix. So in the end, it’s sort of a toss up as to which is a better bet. The downside: my version isn’t a neat, perfectly packaged bar and it has 10 more calories and 2 g more fat than the original version. On the plus side: my version has more fiber, more protein, and less sodium. The bottom line: This “snack” is more of a delicious treat that should be consumed in moderation. But for a healthy snack that will keep you satisfied and your blood sugar stable, stick to the options listed above or try some of my fellow Recipe ReDuxer’s recipes below. I for one am curious to see what everyone came up with! This "snack" is more of a treat and should be eaten in moderation! Coat a 9-inch square baking pan with cooking spray and line with parchment. Lightly spray parchment. 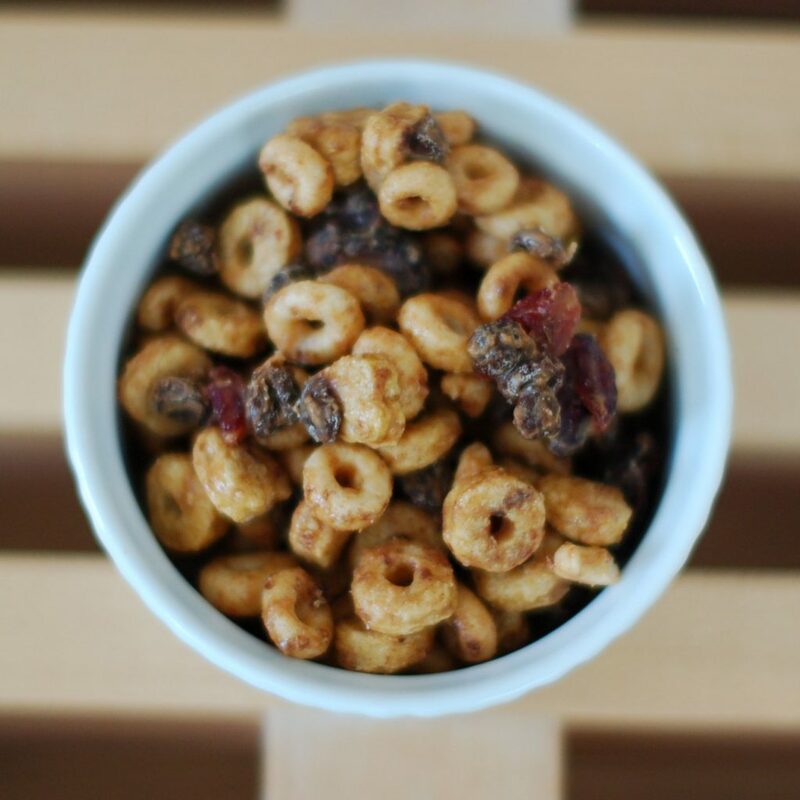 Place both cereals, flaxseed, and dried cranberries in a large bowl. In a small saucepan, combine olive oil and peanut butter. Cook over low heat until the peanut butter is liquidy and the oil is fully mixed in, about 2 minutes. Remove from heat and stir into cereal mixture until combined. Let mixture cool slightly, about 4 minutes, then stir in chocolate chips. With a spatula press mixture into pan. Refrigerate for at least 20 minutes to let it set. Cut into chunks or break apart and divide into ziploc bags for easy portion control. I stored the trail mix in the freezer to keep it from getting extremely gooey, especially in the warm weather. What’s your favorite travel snack? Bars or loose form, this looks like delish snack to me! Thanks EA! They are definitely yummy!! These sound and look soo delicious as is but I would not abandon hope of achieving a bar. Gretchen used whey protein in her crackers and said it helped with the structure. I wonder if this is all you need? Thanks Diane. I have never used whey protein – have to look into that.